Modern Christians often interpret creation traditionally. In the traditional Latin Vulgate, the word for finish on the seventh day is perfecti, meaning completely finished. However, the verb finish has is imperfect in the Hebrew text. Hebrew imperfect verbs refer to continuing or repeated actions. In a language with verb tenses, it makes no sense to say “God finished the heavens and earth, yet he continues to finish them.” However, biblical Hebrew had no verb tenses. It was not structured around a concept of time. In English you cannot be finishing what is finished and you cannot be doing what is done because “finish” and “done” are referenced to time. Ancient Hebrew did not have past, present or future verbs. In Hebrew, to finish is referenced to other events in the context of the narrative (called aspects), not time. One can continue to finish what is finished because some aspect of the work is complete but others are not. Genesis 2:1 – 4 Thus the heavens and the earth were passively continuing to complete (pual imperfect) and all their hosts. By the seventh day God continued to complete (piel imperfect) His work which He had done, and He continued to rest on the seventh day from all His work which He had done. Then God continued to bless the seventh day and continued to sanctify it, because in it He rested (completion) from all His work which God created (completion) and been making (infinitive). This is the account of the heavens and the earth when they were passively creating (infinitive), in the day that the LORD God was making (infinitive) earth and heaven. The finishing verb (kalah) in Genesis 2:1 is pual, which indicates an intense action: something becoming stronger, more in number or more real. God is not making the heavens and the Earth more in number, stronger or more real, so in that respect he finished. Yet the passive, imperfect nature of this verb shows that the finishing is passively incomplete. Genesis 2:2, God ended (same kalah Hebrew root) his work and rested on the seventh day. Here the verb for finish is piel showing that the intensive action of making the heavens and earth more in number, stronger or more real, but without the passive component of the verb used in verse one. The verb is also imperfect showing that the action of finishing the heavens and earth continues, repeats or is extended. Evidently God’s continuing work in the creation of the heavens and Earth does not have the intensity of the first six days, but God’s work in the heavens and earth continues. Do other biblical texts support the incomplete (imperfect) finishing of the heavens and Earth? Hebrews 4:3 His works were finished from the foundation of the cosmos. The context mentions the seventh day, so the days of creation are in view. The word finished is an aorist, passive-deponent participle. Aorist verbs are tenseless (not referenced to time), similar to the untensed Hebrew verbs in Genesis. The deponent participle shows both active and passive characteristics and the participle means finishing, as with an “ing” ending in English. At some point God ended the intensive activity of creation – yet it passively continues. Is God still at work? When the Jews accused Jesus of violating the Sabbath, He said my Father continues to work (passive) until now. The Father works even on the Sabbath, so God’s rest is a lowering of activity, not inaction. Exodus 20:11: In six days God made (perfect) the heavens and the earth, the sea and all that is in them. Therefore He blessed the Sabbath day and made it holy. His rest (perfect verb) on the seventh day does not mean He stopped renewing, sustaining or changing since other verses support God’s continuing interaction with creation. His intensive actions in creation were completed. Job 38:39-42 “Can you hunt the prey for the lion, Or satisfy the appetite of the young lions, When they crouch in their dens And lie in wait in their lair? Who prepares for the raven its nourishment When its young cry to God And wander about without food?” God takes credit for feeding lions and ravens, who were herbivores during the garden phase (Genesis 1:30). Many parallel digestive and instinctual changes are necessary for a fruit eater to become a carnivore or an omnivore. Only God could make such changes. Job 12:10 “In whose hand is the life of every living thing, And the breath of all mankind?” Jesus said not one sparrow will fall without your Father (Matthew 10:29). The middle deponent for fall does not mean He made the sparrow fall. God is not making new kinds of animals, so the intensity of creating life ended. When Adam sinned, God cursed all the animals and the ground with a passive curse. The resulting degenerative changes occur naturally (passively). However, He is also adapting animals to the changing world, to preserve their life. This is God’s providential care, NOT random, evolutionary speciation (where new kinds of animals form). “He is good to all and His mercies are over all His works” (Psalm 145:9). This is a portion of Albrecht Durer’s “Adam and Eve” painted in 1507, therefore, not under copyright. 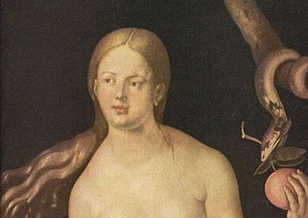 Notice that in Albrecht’s painting, the serpent brings Eve the forbidden fruit. He also is at work with respect to the physics of our planet. Psalms 136:6 “To Him who spreads out (in unbroken continuity) the earth above the waters, For His loving kindness is everlasting.” A global expansion seam running through each sea oozes out basalt along the length of the seam. The oldest seafloor is adjacent to the continents and the youngest alongside the seam. The continents only fit together on a tiny globe without major surface seas. The theory of subduction is denied by the absence of scrapped off marine oozes or sea mounts in the “subduction trenches” where scientists claim the earth continually swallows its crust. A God who claims to spread out the earth in unbroken continuity is not completely at rest. The picture of the growing Earth is from Michael Netzer and shows how the Earth continues to grow in size as the continents spread apart. Four verses in the Bible support the visible evidence for a growing Earth, what the Biblical God claims He is doing in unbroken continuity. Zechariah 12:1, he continues in unbroken continuity to lay the foundations of the Earth. Day seven mentions the heavens and their hosts, which are also spoken of in other passages. Isaiah 44:24 “I am the Lord who (actively in unbroken continuity) makes all things, stretching out the heavens and spreading out the earth all alone.” In Isaiah 40:22 He claims to, actively (in unbroken continuity) stretch the heavens and the earth. In Isaiah 40:26, He continues, in unbroken continuity, to call the hosts of stars to come out by name, none go missing. His glory is available for all to see in the plural heavens, the spreading place (Psalm 19:1-2). Galactic history is the most powerful evidence for a literal creation. Beginning on day four, He continued to form the Sun, Moon and stars and continued to place make them into things that spread out. The earliest galaxies seem to be elliptical, galaxies that do not seem to rotate. Around the giant ellipticals, we often observe strings of equally-spaced spreading-out miniature galaxies. We also find midget galaxies linked back to our Milky way with streams of neutral hydrogen, evidence that they were ejected from the core of our galaxy. The multiplication of galaxies may have happened between day four and day six. Since then, the stars continue to emerge and spread out as billions of galaxies grew into huge growth spirals. This is visible evidence that He continues to call the stars to come out. Evidently He finished the intensity of multiplying the hosts of heaven by day six, but He continues to call the stars to come out, yet not star goes missing. Someone might claim, galaxies cannot grow in only 6,000 years. Please observe that the atomic clocks and the stars streams are both accelerating. The western concept of linear time is denied by the clocks and the star stream orbits changing together as billions of galaxies grew from their unformed-matter beginnings. 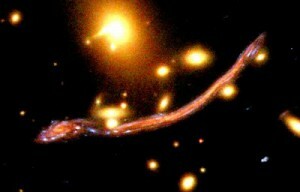 Abell 370 is a galaxy cluster whose light shines at 73% of the frequencies of modern atoms. Notice two small galaxies, one at the end of a jet, emerging from a giant elliptical. The spiral galaxy with the long tail is known as the Dragon. A tail of stars and gas has emerged from this galaxy and threaded past four small galaxies. The presence of OII in the tail shows that it is a single object that shines at 57 % of the frequencies of modern atoms. Stars emerging and spreading out while shining at different clock frequencies does not fit the laws of physics. For this reason, scientists may claim 20 times as much invisible matter (as what is visible) is bending the light and distorting the scene. What is visible only fits the literal creation account.